A Badger infantry combat vehicle. 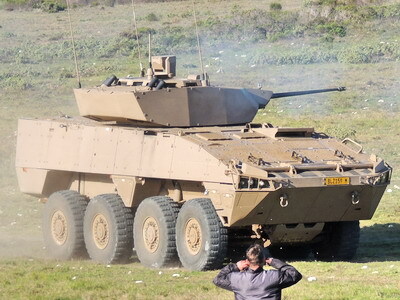 Denel Land Systems (DLS) is still battling with issues on the Badger infantry combat vehicle for the South African Army, which has seen delays and cost overruns. The development and production of the Badger vehicle under Project Hoefyster was initially expected to be completed by December 2018. However, Denel said in its latest annual report that the design complexities within the programme have resulted in the delayed deliveries on the production of the system and increased the estimated cost to complete the contract. “We are engaging with the customer to determine ways in which Denel could achieve the contract requirements despite the delays,” Denel said of the R9.4 billion programme. Progress on the development phase slipped due to technical difficulties which has resulted in the delivery of the first 88 Badger Infantry Combat Vehicles (ICVs) to the South African Army being delayed to 2022. A major re-planning effort, which is being negotiated with the client, is underway to determine the new contractual schedule going forward. In the 2018/19 financial year the plan is to address outstanding requirements preventing production from commencing with deliveries of an initial eight systems used for process qualification. Denel said that progress in the development phase of Hoefyster is made to the extent that the Product Base Line for the Command Variant was established whilst the overall technical progress combined on all the variants is 93% to completion. Industrialisation for the Section variant turrets is well under way, whilst all major suppliers are already delivering the major components, including the 30mm main weapon from the Denel Land Systems production facility. One of the spinoffs of the Badger programme has been the salve of turrets to Malaysia for its AV8 armoured vehicles. Denel said that in the last financial year it achieved a major milestone with the AV8 programme with the delivery to the Malaysian client of LCT30 light combat turrets, anti-tank guided-weapon turrets (ATGW) and remote-controlled weapon station turret (RCWS) systems. To date 56 of the contracted systems – out of 122 – has been delivered to the end user and some deployed in operations. Delays incurred, however, affected export revenue recognised for 2018. Denel Land Systems contributed 24% of the Denel Group’s revenue in 2017/18, bringing in R1.093 billion, R575 million of which was export-related. In the 2017/18 financial year, Denel Land Systems made a loss of R683 million, down from a profit of R174 million the year before. Denel added that it had successfully installed Military Image Interpretation Computer Systems (MIICS) and associated training systems for the South African Air Force (SAAF) under Project Achilles in the Joint Air Reconnaissance Intelligence Centre (JARIC) at AFB Waterkloof.